Strengths: Evgeni is one of the best acrobatic goalies with lots of confidence in facing the game’s best shooters. Nabokov has sharp reflexes that help him stop sure goals. Weaknesses: His acrobatic moves can make him overreact to shots. At some points in a season he loses consistency and his play has been in decline recently. Biography: Kamenogorsk is famous for its hockey. Evgeni Nabokov’s father, Viktor, was a goalie. At age six, Evgeni decided to play that position, not only because of his father, but also because he felt comfortable guarding the net. Evgeni played for his hometeam before joining Dynamo in Moscow. In the C-Pool of the 1994 World Championship, Nabokov played three games for Kazakhstan. His next international appearance, twelve years later, would be for Russia. Nabokov was one of the last picks selected in the 1994 NHL Entry Draft. The team that picked him, the San Jose Sharks, had never even seen Evgeni play. Nabokov later commented that he only found out that he got drafted by reading a newspaper a couple of days later. While posting good numbers with Moscow Dynamo, Nabokov was forgotten by the NHL until being seen by a Sharks representative at a tournament in Finland in 1997. Evgeni was hesitant to sign a North American contract. 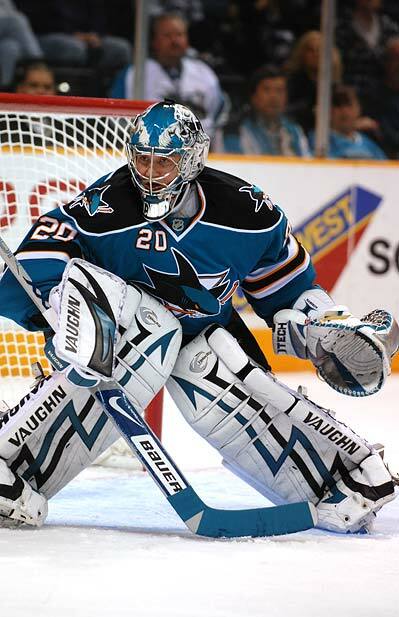 Eventually after three years of building North American experience in the AHL, Nabokov became San Jose’s starting goalie in 2000. His skills earned him the support of Vladislav Tretiak, in whose honour Nabokov wears number 20. 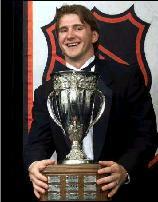 In his rookie season Evgeni played in the NHL All-Star Game and won the Calder Trophy as rookie of the year. 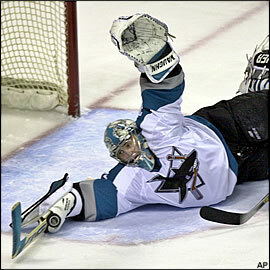 He had a tough 2002-03 season, but rebounded in 2003-04 to take the Sharks to the Western Conference finals. 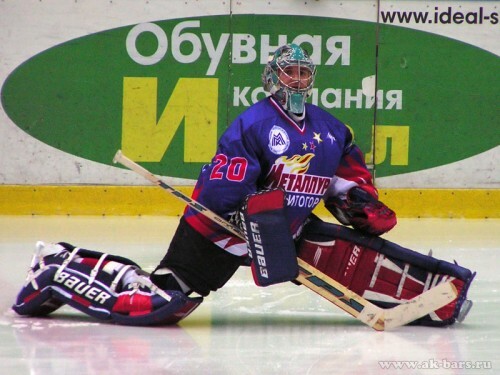 During the NHL lockout, Nabokov briefly played for Metallurg Magnitogorsk. He also took part in Igor Larionov’s farewell game in Moscow in December 2004. In 2006, Nabokov briefly lost his status as the Sharks’ #1 netminder, but was spectacular in his debut for Russia at the winter Olympics in Turin, Italy. 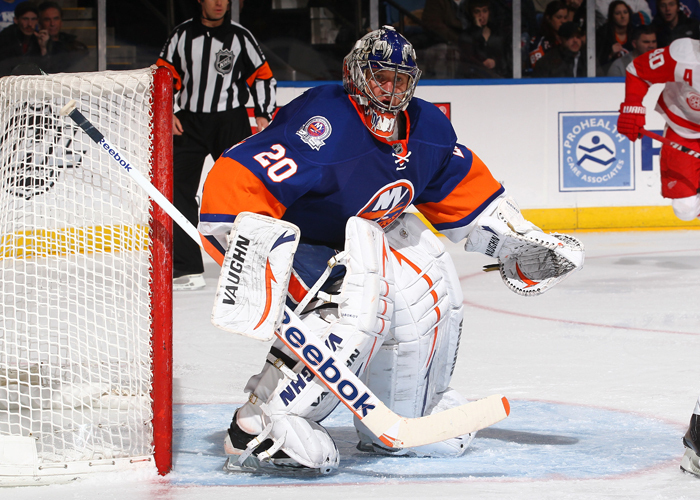 Nabokov had three shutouts, including one over Canada. 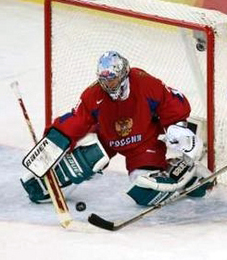 After a gruelling loss in a four-overtime second round playoff game in 2008, Nabokov was quick to join Russia at the World Championship in Quebec and was an integral part of its gold-medal victory. Nabokov was named the best goalkeeper of the tournament. In the same year, he was the runner-up for the Vezina Trophy as the NHL’s best goalie. In his last year with the Sharks, Nabokov helped his team reach the conference final of the NHL playoffs, but San Jose decided not to renew his contract. 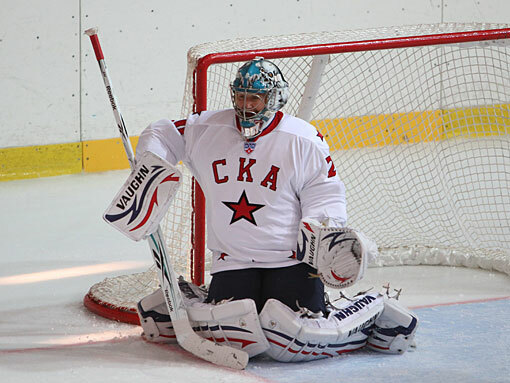 In 2010, Nabokov returned to Russia to play for SKA St. Petersburg, but his stay did not work out as hoped and Evgeni attempted to return to the NHL mid-season. He signed with the Detroit Red Wings, but was claimed on waivers by the New York Islanders – a team he refused to play for until the 2011-12 season. Nabokov has since provided the team with long-awaited consistency in net and helped the Islanders get back to the playoffs for the first time in six years.